Bio: Pennsylvania artist Alice Laputka is a graduate of the Philadelphia College of Art (now the University of the Arts) with a BFA in advertising. Her background includes print design, television graphics, animated film work and teaching. She has studied with Bill Herring (who helped get her gallery representation), Miles Batt and Katherine Chang Liu. She has had over a dozen solo exhibitions and has exhibited in over two hundred regional, national and international juried shows. Her paintings are in numerous corporate and private collections throughout the United States. Her paintings have been featured in Pastel Artist International Magazine, International Artist Magazine and The Artist’s Magazine as well as Rockport Publishers The Best of Acrylic Painting. A feature article Windows of Colour in the October 2012 issue of the Pastel Journal is an excellent exposition of her approach and method. Laputka has done editing and writing for the Pastel Society of America where she holds signature member status. She has been inducted into the Master Circle of the International Association of Pastel Societies and is a signature member of the Catharine Lorillard Wolfe Art Club, Knickerbocker Artists, the Pennsylvania Watercolor Society, and the Philadelphia Water Color Society. She is a professional artist member of the Main Line Art Center and an exhibiting member of Philadelphia Tri-State Artist Equity. Medium: Pastel; oil;watercolour. Laputka often creates her own support from Lenox or Stonehenge printmaking paper which she coats with two layers of equal parts gesso or acrylic paint, ground pumice and distilled water. With a paper surface she also covers the back with gesso to prevent the paper from curling. She also uses Strathmore illustration board, watercolour paper, or hardboard. Style: Colourist. Laputka’s work reminds me of the late Elsie Dinsmore Popkin, but more abstract in approach. Navigation: While the website is easy to work around, the design elements are lacking, especially on the pages where thumbnails seem lost as they are widely dispersed on the page. The enlarged images open on a page where no links whatsoever are provided, not forward, not back. Of the three links to artists’ sites, one is incorrect; and Jan Crooker, when found, is not a pastellist, as the link suggests. Image View: Each thumbnail may be enlarged; information on each image is provided. Enlargements open on a new page, with no links to anywhere – either use the back button, or open the enlargement with a right click- open link in new tab/window. 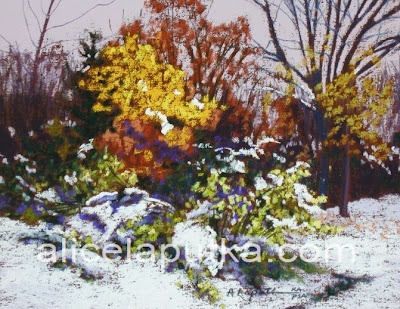 Download is possible but all images have a large watermark.I have chosen to feature Fall Snow (671 x 518, 349 KB) as the watermark is not too obtrusive in the snowy ground.